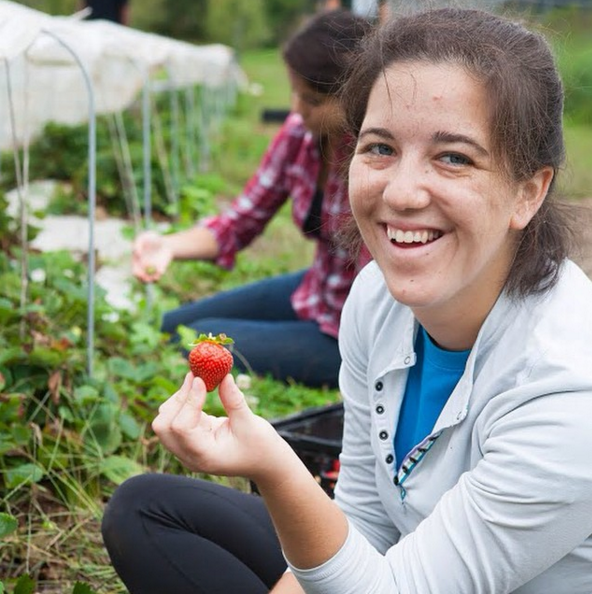 Sara, FRN's Director of Member Support & Communications, gleans strawberries with the FRN team. Have you met Sara yet? As FRN's Director of Member Support & Communications, Sara is thankful to be working to build a community of active and engaged young people that generate tangible, positive progress. She can't wait to meet everyone at the 2016 National Food Recovery Dialogue! Read more about Sara below. What's one thing you love about FRN? Only one thing?! The FRNdship. I'm so motivated, inspired and thankful to be working to build a community of active and engaged young people. The issues of hunger and food waste (and the way they stem from and relate to social and environmental justice, poverty and climate change...) are tremendous and it's so easy to feel small and powerless. But being part of FRN is a way to take tangible, positive steps to fixing systems that are broken; changing the status quo alongside thousands of other student and community leaders. Also it's fun! As our core value says, "do good, feel good." What are you most looking forward to at the 2016 National Food Recovery Dialogue? Lunch! No but seriously--as a national Network, the chance for all of us to be in the same physical space chatting and laughing is so special and exciting and lunch will be the first time that that will happen. I also can't wait to bring so many leaders together to celebrate our accomplishments and to dream about what's next. What do you like to do when you're not helping fight food waste and hunger? I spend my time baking, reading, catching live music in unique spaces, visiting friends and drinking/learning about beverages. What's your favorite food? I'm an advocate for breakfast all day, so I have to choose the open-faced waffle-egg sandwich. It starts with a waffle, then thin slices of Coulommier cheese and a fried egg, plus salt and pepper to taste. I actually haven't found Coulommier cheese since I lived in New Hampshire, but luckily brie and sharp cheddar make fine substitutes. Are you as excited about the 2016 National Food Recovery Dialogue as Sara? Register here today.